How would you like to win a bike before Christmas? Halfords are giving away a bike each week until December 13th, all you need to do to enter is ask your child to draw their dream bike, take a photo and then upload to the website. The prize changes weekly, first up is the super cute Apollo Police Patrol 14″ Kids bike. I was searching through old videos last week and came across one of the Christmas where my two oldest children received their first bikes from Santa, Sydney immediately sat on hers, hurt her bottom and started to cry, but the look on her face when she saw the bike is just the most magical thing. Seeing a bike under a tree with happy children is for me the start of a dream Christmas which is made even better by that first bike ride in between a Christmas Day breakfast and lunch, when everyone is wrapped up in coats and scarfs, there’s a sprinkling of snow on the ground and children from the neighbourhood are out testing their new bikes and roller boots. In my 9 years of being a parent, I have bought many a bike ( and car seat ) from Halfords and always found their service to be exceptional. 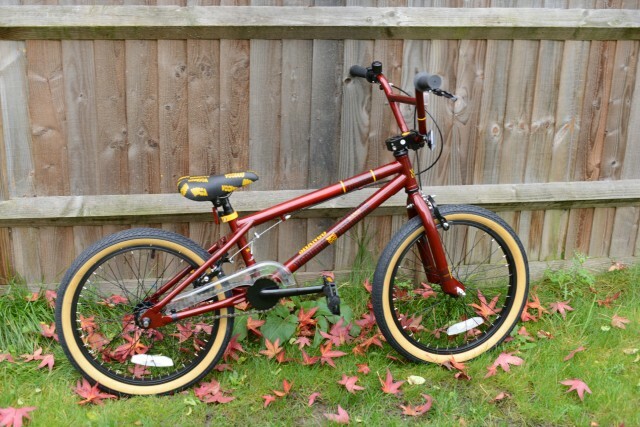 When we recently picked up this Voodoo Shango Limited Edition BMX for my son the staff were full of helpful tips and advice and the service quick and smooth. Did you know you can order a bike online and collect instore? Or reserve in store for just £10 and pay either in instalments or on collection. Halfords will even store your bike for you until Christmas, build it for you and give you a FREE 6 month check!! To win your own Voodoo Shango Limited Edition BMX, simply complete the rafflecopter from below. Wow what a fabulous giveaway. Thanks for the chance. Nice looking bike, I could see my Vee blatting it to school. Mummy Fever recently posted..Learning to ski: what’s the best age?